Whoo, the title to this one was so boring, I kept having to look it up to remember it. Let’s get cracking. Recap of the Donatello storyline, which does not bode too well for Donatello. Sorry, Mr. Redshirt Prophet. I’m gonna miss you, Keith. Cut to Jack, who wakes up in the Bunker to hear the Brothers talking about how glad they are to have him back. Then the alarm goes off and smoke comes through the grate in the bottom of the door. He rushes out into the corridor to find that Sam and Dean are trapped inside a room and calling for help. He tries to use his power to break through the door, but he can’t get it open as they plead for their lives. I’m sure it’s a surprise to no one watching this that it’s a mind game (am getting tired of the whole “Let’s make the protagonists look like fools” trope. It’s greatly overused of late). The only twist is that it’s alt-Zachariah doing some kind of mind control thing on Jack to get him to use his powers to make an interdimensional rift at alt-Michael’s behest. Alt-Michael tells Zachariah to hurry up and get it done, and Zachariah thinks he knows a way to do it. No, sadly, we do not get Kurt Fuller back. Donatello is working on the Demon Tablet, writing down words and phrases: “blood,” “symbols,” “danger,” “open the tear into worlds,” “all will burn,” “the born one.” Comforting messages like that, while distorted voices that kind of sound like Sam and Dean harangue him. Castiel knocks on the door and asks to come in. He brings breakfast and asks if Donatello is all right. Donatello says sure (as he hides something under a paper), but does comment that the tablet has a lot of power. He also says he’s “making progress.” As soon as Castiel leaves, Donatello uncovers the paper and keeps working on it. In the kitchen, Dean is eating a plate-ful of bacon, while Sam kvetches. Business as usual on that end. Dean: Dude, if bacon’s what kills me, I win. So, Castiel comes in and we finally get what the plan was last week – they were going to tap some of Lucifer’s archangel grace for their spell. Okay, whatev. Meanwhile, Jack finds himself on a misty beach near Vancouver. “Castiel” shows up and says he wanted to show Jack the world before it was ruined by humans. Except, like Apocalypse World has been “saved” by angels and look how that turned out. Hmm. “Castiel” claims that Jack has to use his powers to “save us all,” that Sam and Dean taught Jack to “fear” his powers. Jack finally buys a clue from Vanna and realized this isn’t Castiel. He wakes up in the grody old church that is alt-Michael’s hideout. Losing patience, alt-Michael tosses Jack and alt-Zachariah into respective corners and then grabs Jack for “my way.” Because that’s been working so well so far. Castiel says he’s “heard rumors,” but didn’t realize Gog and Magog were actual people. Donatello says they were warriors who had “enslaved half the Fertile Crescent” before being locked away beyond space and time. Castiel offers to go fight them and Dean says he’ll come with. As Castiel looks suspicious, Donatello too-cheerfully says he and Sam can stay behind to find the ingredients. I’m sure this will end well. Cut to Jack getting dragged through a hallway. Remember Dean getting dragged through the angels in season nine premiere, “I Think I’m Gonna Like It Here”? They rip that off. Poorly. Alt-Michael apparently needs a lantern to light his way as he drags Jack to a cell where he tosses him in. There, Jack finds Mary. To her credit, Mary quickly figures out who Jack is when she hears his name. She tells him she was present at his birth. She’s also relieved to hear her sons aren’t in Apocalypse World. Jack admits that Michael got inside his head and made him do things. Mary tells him she saw Michael’s grand plan when he got inside her head – he’s going to bring an army to the SPNverse (in other words, alt-Michael is a Bond Villain: Evil Overlord Variant). She explains to Jack that alt-Michael will hurt her to make Jack do what he wants. We also find out from the dialogue that it’s currently six months after Jack’s birth at the end of last season. As they gear up to go, Dean asks Castiel how he’s doing. Castiel frets that he was brought back for a reason (Dean tells him Jack brought him back and Castiel looks a bit shifty, but doesn’t mention the Empty Entity), but so far, he’s failing Jack, that Michael (he doesn’t specify which one) is all about making war. Dean gives him a pep talk about how they will power through and off they go. Meanwhile, Sam and Donatello are gathering ingredients, while Donatello runs through a series of Untrustworthy Expressions behind Sam’s back. In a clearing in a forest in Vancouver, probably somewhere in Stanley Park, Dean and Castiel talk strategy. Castiel says that Donatello said Gog and Magog could only be killed “by a weapon touched by God” and promptly hands Dean an angel blade. Dean casually takes it (remember when angel blades were rare and awe-inspiring? Kinda miss those days) and Castiel does a summoning in Enochian, no spellwork. At first, nothing happens and Dean gets sassy about Castiel’s Enochian pronunciation. Castiel is snippy in response, which causes Dean to roll his eyes. 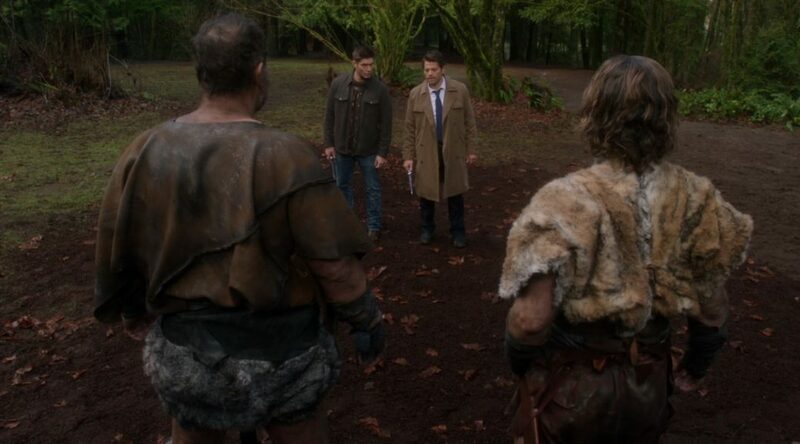 Gog and Magog show up (behind Dean and Castiel, of course), making the earth shake with each step. They look more like Vikings than guys from Ancient Mesopotamia and they’re wearing leather diapers. Dean snickers to Castiel that they’re wearing loinclothes. No, man, those are diapers (which Dean finally acknowledges). Meanwhile, Gog and Magog are commenting in Ancient Canaanite (more or less) on how “pretty” their latest adversaries are. They finally decide which one to attack. One goes after Castiel and the other after Dean. Dean gets his angel blade shattered by a sword early on. When he yells to Castiel (who is getting tossed to the ground) about what to do next, Castiel shouts back that they can only be killed by weapons “forged by God,” which is different from what he said before. Dean gets his guy into a headlock, but then gets flipped over. He avoids a sword cut, manages to get hold of Gog (think it’s Gog)’s sword and beheads him with it. Magog is about to make short work of Castiel when Dean stabs him from behind. Dean [grumpily]: Forged by God; touched by God” – same thing. But they run into a snag when Castiel goes to retrieve Magog’s heart and finds only sand. It turns out Gog and Magog are not human at all but magical constructs from before the Flood. They have no hearts. The thlot pickens. Meanwhile, Mary is trying to get Jack to let alt-Michael kill her rather than open the door to the SPNverse. Jack insists he can save them both, but his powers keep going wonky and his head hurts. Mary admits her head hurts, too. She thought it was the torture, but now she wonders if it’s because the angel warding is so strong that even humans can feel it. She finds a place in the cell (conveniently near the only window) where she doesn’t have so much of headache and guesses that’s where the warding is weakest. Jack starts working on breaking through the window. Back at the Bunker, Donatello is stalking an apparently oblivious Sam, who doesn’t hear a warning call on his cell from Dean. Donatello then smacks Sam in the head with a bottle and keeps on smacking. So, alt-Michael is, to put it mildly, unhappy about Jack and Mary’s jailbreak. He orders Zachariah to go get Jack back, kill Mary in front of Jack (slowly), and not fail him again. Back at the Bunker, Dean and Castiel arrive to find the place a bit trashed and Sam nursing a large welt on his head. He has a raving Donatello on lockdown in their dungeon. Castiel explains about how Gog and Magog didn’t have hearts, which means the spell was fake – Donatello was trying to send them to their deaths. Alt-Bobby takes Mary and Jack to his camp and explains that the angels are systematically exterminating humans. As they bond over coffee spiked with whiskey (and Jack does puppet theater for a bunch of kids), alt-Bobby spells out that Mary of his world never made her demon deal, so John didn’t come back from the dead and she never had Dean and Sam (that order again). She says they saved her world. Alt-Bobby says he didn’t go back with them because he’s about the only thing his world has to save it. He is rather less thrilled, however, when Mary admits that Jack is a Naphil, and insists Jack be out of the camp by dawn. Even when Mary says she’d leave, too, alt-Bobby insists that the angels turned on humans, despite initially seeming to be their allies, and Jack will, too. Fortunately for Jack, the angels attack in the morning, apparently attracted by Jack using magic in his shadow puppets the night before. Mary tells Jack to run and gets a mission from a grumpy alt-Bobby to rescue as many kids as she can. Jack is running when he hears children screaming and goes back to help. Meanwhile, Mary has been caught out by Zachariah, who is about to kill her when Jack shows up. Jack kills him, instead, then foils another attack by angels (not impressed by the whole fireball thing instead of wings) by blasting them out of the sky, saving the whole camp. Alt-Bobby is properly impressed. Yeah, I kinda figured early on that Mary would end up a Mother figure to Jack. Back at the Bunker, the Brothers try to interrogate Donatello, who cackles that he’s translated the entire Demon Tablet (didn’t Kevin already do that years ago? Why does it need to be translated again? ), then does a suffocation spell on Dean. Dean’s okay once Sam gets him out into the corridor (just as a worried Castiel, who was watching on a monitor, shows up), but Donatello is clearly cuckoo for Cocoa Puffs. TFW tries to figure out what went wrong with Donatello. Castiel insists that Prophets can’t be corrupted by the Tablets. They’re only “conduits” of God’s power. Sam then points out that Donatello no longer has his soul (this didn’t come up before?) and Castiel speculates that without the “filter” of the soul, Donatello was corrupted. There’s then a flurry of discussion. Sam gets mopey and says they can never get Donatello’s soul back because Amara “ate” it. Dean doesn’t exactly contradict him, even though Amara told him once that all of the souls she ate still existed inside her, apparently as intact souls. So, theoretically, it’s just a case of ringing her up and persuading her to give it back, which, theoretically, Dean could do. Donatello isn’t dead, per se, but his mind is wiped and the Brothers are forced to leave him at a nearby hospital in a coma. Castiel tells them that Donatello was working for Asmodeus and that “some people can’t be saved.” Dean still calls him out on it, though Castiel justifies it as necessary because they are at war.